Well ..... a patchwork ottoman empire! Using fabrics purchased at Stitches and Craft a couple of weeks ago. I'm a proud Aussie today surrounded by all this local design talent. That is fabulous Andi, love it! That is amazing! Those fabrics look great all together. Would it be wrong to kill for patched footstools??? Andi, it's wonderful. Love it! gorgeous! well done, it looks stunning! that wouldn't last long with my 3 around but you have bigger kids so don't have my problem! Breathtakingly stunning! You are a very talented woman! Truly inspiring. Wowee you're so quick at all these patchy materpieces! Stunning. Whoops that should be MASTERPIECES! ps what's with such a clean room? Where's the kid crap? Wow! Andi, that ottoman looks gorgeous, and you made it so quickly!! I'm so impressed! I haven't had time to do a post show blog entry and you've created that! Very clever! Andi, I hope that no-one is permitted to so much as set a derriere or a foot on that - its gorgeous! You really don' tmuck around. Huge fan of all those fabric designers - great job. I have not yet even unwrapped my ink and spindles and kirstin's panels from stitiches and craft (sigh) but have tackled a couple of the keilani splurges . I Say good on you! Inspiring craftsers everywhere. Fabo Mrs. Now we know why you were trawling around suitcases of Stitches shopping. How long did that one take to whip up? During an episode of Masterchef?!?!? Gorgeous! And - what is the key fabric? I think I need some! It is fabulous! I love it. WOW! You never cease to amaze me! This is so awesome! What did you use as the base? I really need one of these w/ 2 little kids. I have no ottoman/coffee table and I need something like this! This would be perfect! this is so gorgeous!!! i love those fabrics. is anyone really allowed to put feet on it? Very Very nice, the fabric is wonderful.... A Great JOB! 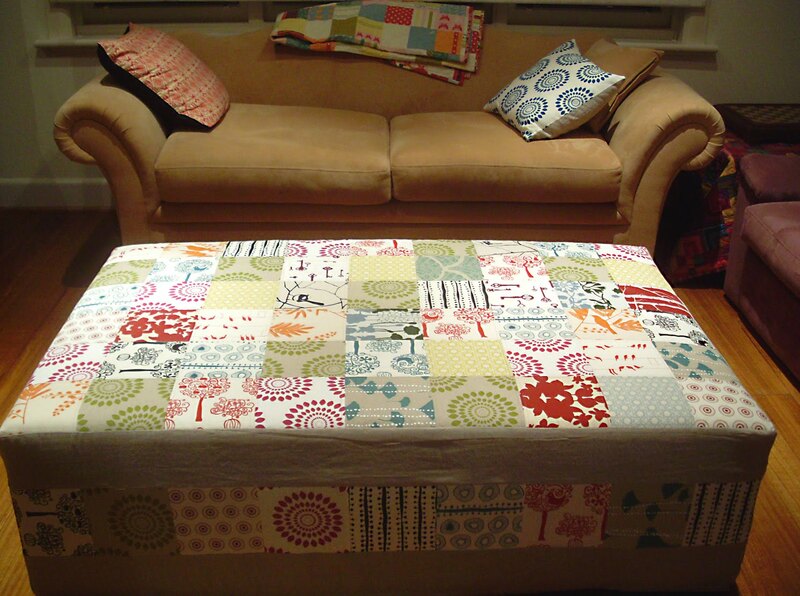 This is so suoer well done and i like your vintage sheet quilt as well. You did a great job!! Thanks for showing us and yes we are making a greenhouse, thanks for your comment on my blog. Have a good day! and it looks sooo cool! Wow! this is Fabulous...too Nice to use..Very Clever. just delightful, love the colours and the fabrics, they really do go nicely together. Now I am wishing I had an ottoman to cover - I'm thinking the same effect would be hard to achieve on a bean bag ;-). I just love all our "native" fabric, and it harmonies so well. It reminds me I have a few pieces from I&S somewhere, waiting to be used. you took that awesome aussie fabric and made it even more amazing! That ottoman is to die for. Looks great Andi - you're very clever! This is gorgeous! Very clever! Stunning combination of fabrics. A really gorgeous piece of furniture! 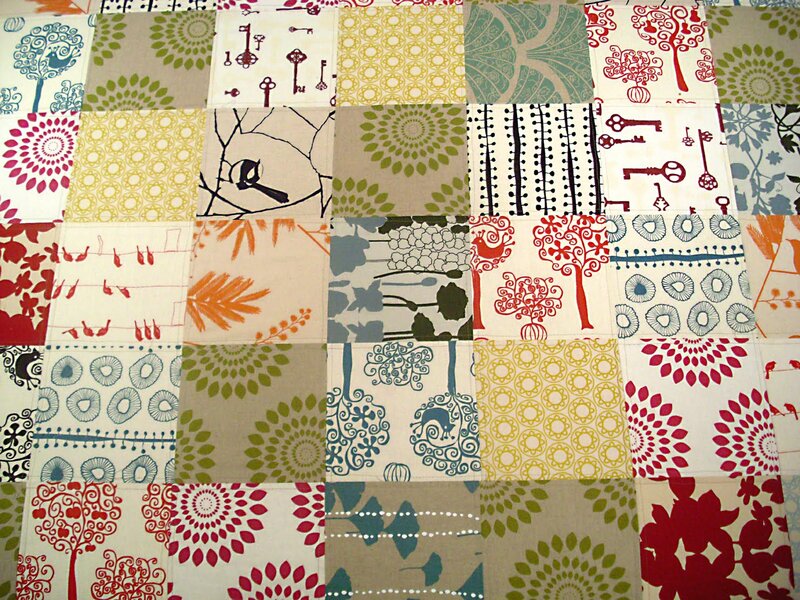 My new favourite machine quilter is Bev from Be My Ballantyne in Camberwell. She did my quilt basting. Wow, so impressive. 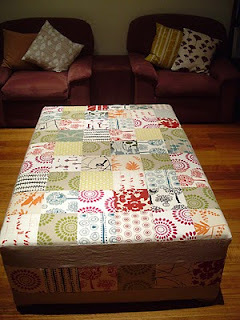 What a great idea, I love the "local" touch using fabrics from Australian designer. LOve it Andi- you are very clever & very quick!! wowza! I saw this on Pippijoe's blog, it looks awesome! Really stylish, and so great to use local designers' fabrics - I love furniture (well, more like a piece of art)with a story! look at all those delicious fabrics. Your so very clever! Oh no - another thing to add to the list. Andi it is absolutely stunning and of course I WANT ONE!!! that is beyond fantastic! 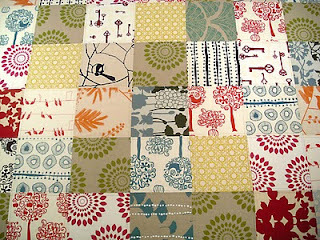 What an inspired design Andi, I adore it and am going to try and copy you if you don't mind - most inspiring piece of patchwork I've seen in ages! Your ottoman is so beautiful. I love all the materials you have chosen. They look amazing all together. stunning! Love that you used all Australian designers too. You are ace Andi. Ace because this is the most awesome ottoman I've ever seen, and also Ace, because you've just inspired me to do up my ottomans the same way. Expect a post from me about this in a year or so... (but the idea's in my head at least :)! The fabrics are seamlessly beautiful perfectly fits for comfortable bed.